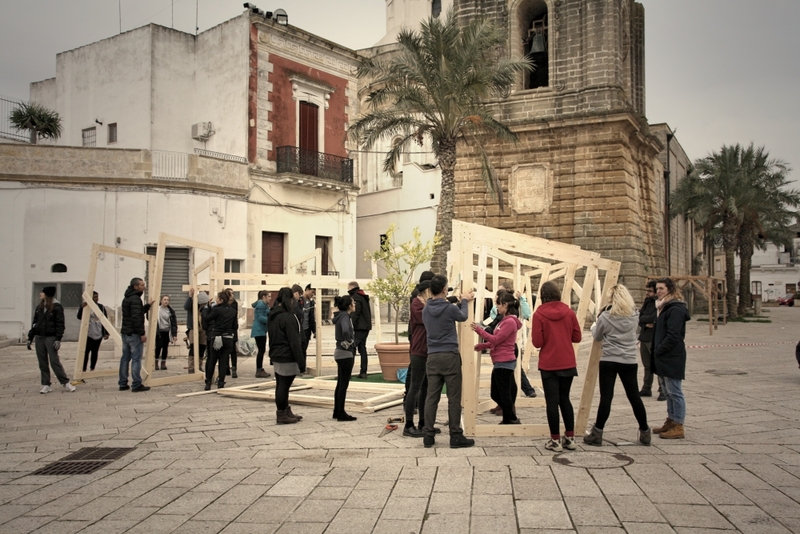 “The Secret Garden” is a project promoted by the School of Architecture at the University of Portsmouth and the City Council of Campi Salentina in Italy. 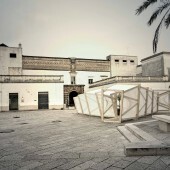 The pavilion, whose function is to house temporary exhibitions, has been designed by architecture students under the direction of Senior Lecturer and Architect Guido Robazza. The initiative is part of a research project investigating the power of temporary use of public space as a tool for urban regeneration. 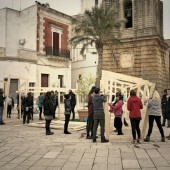 This urban pavilion project is a component of the participatory process CHECENTRO established within the Urban Plan for the Regeneration of the Historical Center of the City of Campi Salentina and has been locally coordinated by Marco Patruno (MAD – Meeting Architecture and Design). A special thank-you goes to Paolo Robazza (BAG – Beyond Architecture Group) for the technical support and the planning of the workshop; Phevos Kallitsis for the design advice; Nikos Nanos and David Begg for the structural consultancy; Silvio Caputo, Roberto Braglia, Steve Read, Plamena Gamzova and Remo Fabrizi for the valuable support. Other Facilitators: Marco Patruno (MAD – Meeting Architecture and Design), Paolo Robazza (BAG – Beyond Architecture Group), Phevos Kallitsis, Nikos Nanos, David Begg, Silvio Caputo, Roberto Braglia, Steve Read, Plamena Gamzova and Remo Fabrizi. Students: The design of this project is based on the brilliant ideas of our amazing students: Mariana Luiza Lopes Barros, Matthew Ian James Campbell, Lucy Anne Clark, Isabel Emma Clay, Naomi Cripps, Gabriela de Nadai, Bryony Faulkner, Anna Georgiou, Aleksandra Gutkowska, Mollie Hayter, Aimee Higgs, Charlotte Holt, Kalin Peykovski, Benjamin Cheng Jie Khor, Francesca Lawes, Fenoula Titania Lee, Whitfield Matthew, Omotola Oluwaseun Olukoya, Lisa Pang, Audrone Rutkauskaite, Ciprian Selegean, Devyani Vijayakumar, Stephanie Louise Wyant. 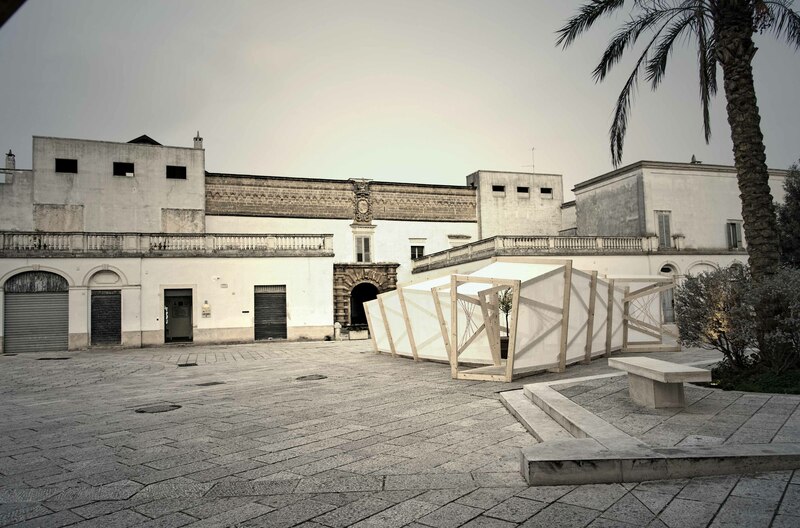 Research Question: The construction of this temporary pavilion is part of a wider research project, titled “Placemaking and Temporary Use of Public Space – Tools for Urban Regeneration” which builds on the assumption that, in cities, there is an abundance of unused spaces. Empowering local communities to take ownership of such spaces and decide their use can at the same time raise awareness on alternative potential ways to use the public realm, create links between diverse urban actors, and offer individuals and groups new forms of civic participation. 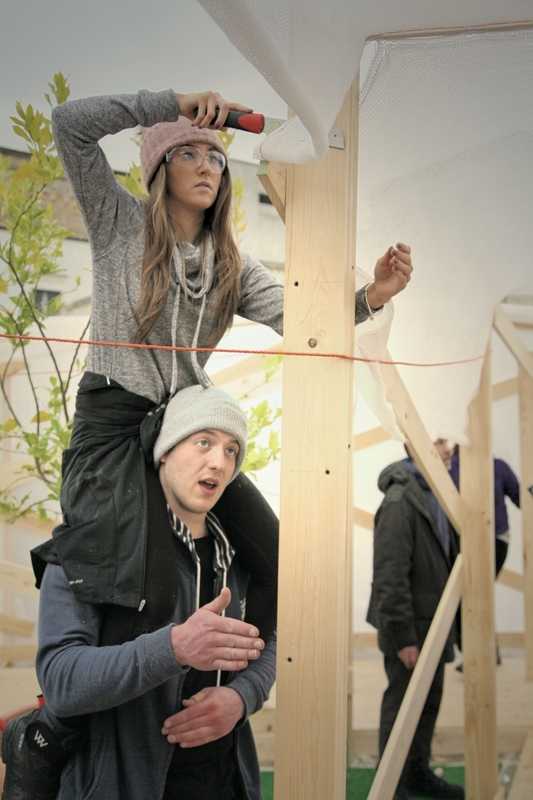 Key actors of this experiment are: the City Council; the School of Architecture; and local charities and collectives willing to participate and express their right to the city. Whilst this type of project it is not new, its originality lies in two elements. Firstly, it comprises several sites across the city, with projects co-designed and built with diverse communities and over an extended period of time. Secondly, it attempts to measure quantitatively and qualitatively the impact of co-creation in terms of understanding and perception of the role of diverse individuals and groups in relationship to the use of public space and local authorities generally. Architecture, Days, Undergraduate, Self-funded, 11-50, Temporary, Collaboration, Extra-curricular, Students with tutor, Campi Salentina, Portsmouth Univ.